Popularity Newest products Lowest price Highest price Name ascending Name descending All brands American Artworks, Inc.
1938, Original Girl in Yellow Dress (aka Girl At Shade) Coca Cola Tray, Excellent condition, minor paint chip on lip of tray, slight scratches, & as-produced flaws in finish. All appropriate markings. 10 1/2" x 13 1/4" approximately. 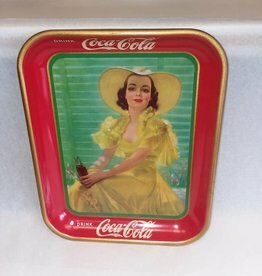 Girl in Yellow 1938 Coke Tray, 10.5x13.25x1.25"